I am so happy to introduce Sally DeCost from Elementary Matters, because I pretty much love everything she writes, and I would have been thrilled if she had taught my own kids. She does her research, and she is tons-o-fun, so you will not want to miss this one. I’m a big fan of the brain! I have no formal training or education about the brain, but I read a lot and think a lot about how the brain learns and what we can do, as teachers, to get the most we can out of the individual brains in our classrooms. It’s fascinating stuff! Most of the information I’ve learned pretty much backs up what I already knew about teaching, but now there’s evidence to back it up as good teaching practices! After a few minutes of a lesson, the teacher tells the children to “turn and talk” about what they just learned. 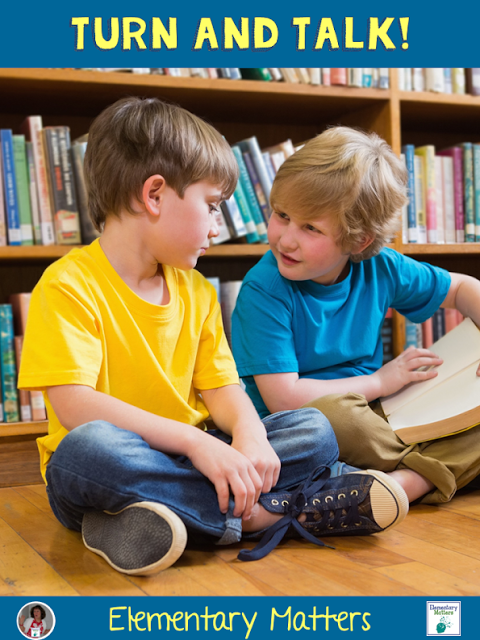 The children immediately turn to face their assigned “turn and talk” partner, decide who will go first, and start a very active conversation! I require my students to use as many gestures as they can, which I typically introduce before the “turn and talk” time. (I tend to be very dramatic when I teach! No one could ever say I’m boring!) The conversation goes back and forth until they’ve had enough time to review. The teacher then asks for volunteers to share with the whole group, or the teacher simply shares what she heard partners say. This happens several times during a lesson, keeping the students busy and engaged throughout the lesson. It might be necessary to do some re-teaching if the kids aren’t quite on track. (Isn’t it nice to find this out right away?) I’ve been known, after a “turn and talk” session, to say, “This is what I heard…” But in reality, I didn’t hear that; I just wanted the kids to think I heard it, because that’s what I wanted them to learn. It works every time, and they never know! Kids are wired to connect. Just like adults, they need to interact. (Sitting for hours and “just listening” won’t produce much learning – I’m sure you already figured that out!) Teachers need to give information in “chunks.” Experts recommend no more than 2-4 chunks of information at a time. Then, the learners need time to process. Students need to take frequent breaks from listening and take time to process what they are learning. They need to review and think about it. Plus, kids need to move, and kids need to have fun! These are basics of brain-based learning, and “Turn and Talk” fits the bill! I’ve seen this work from kindergarten all the way through college and beyond. Think about your own professional development workshops and seminars: Don’t you appreciate the opportunity to talk to your peers and process the information? Take plenty of time to demonstrate how “Turn and Talk” works. I find having students modeling in front of their peers grabs their attention. 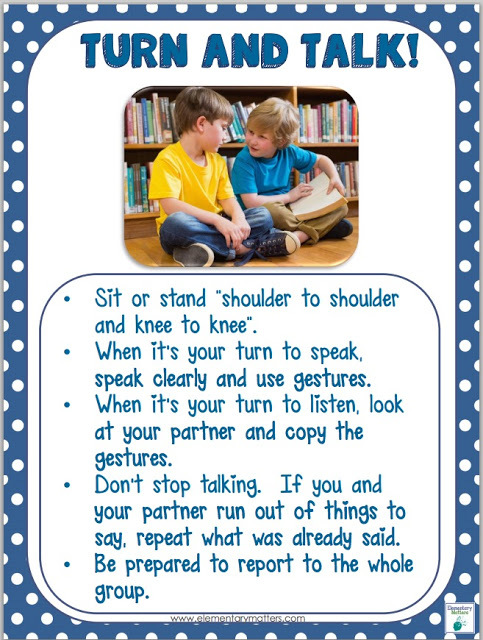 Show them how to sit “shoulder to shoulder, knee to knee.” Make it very clear that they are to keep talking the whole time, even if they have to repeat what they’ve already said. Show the children the importance of gesturing and mirroring the gestures. I also find they benefit from a demonstration of “what NOT to do”! I’ve been known to be very amusing when I model that part! (If you make them laugh, they’ll remember! That’s another aspect of brain-based learning!) Choose “Turn and Talk” partners at the beginning of the lesson, teach a little, and then say, “Turn and talk”! Feel free to download my Turn and Talk Poster by clicking the image below. There’s also a version if you prefer to call it “Think, Pair, Share”! It’s been a pleasure to guest post for Rachel at Minds in Bloom! Sally is a very experienced teacher of 36 years, having taught all grades from preschool through 8th grade, except 4th. She has a B.S. in Elementary Education and a master’s degree in Creative Arts in Learning. She has taught 2nd grade for several years now. She loves sharing her teaching experience and her passion for brain-based learning on her blog at Elementary Matters and selling at her Teachers Pay Teachers store. She also has a Pinterest board on Brain Research! I'm a HUGE fan of turn and talk! Thanks for the in depth explanation, Sally! I would like to know if the turn and talk strategy can be use with preschoolers. How can I do it.